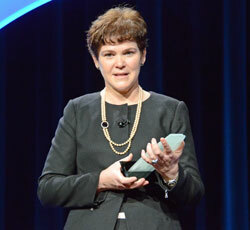 During the general session today a special Pioneer Award was presented to Krysta Harden, Chief of Staff for United States Department of Agriculture Secretary Tom Vilsack. Harden spoke about her experiences over the years working for biodiesel. Throughout her three decades in Washington D.C. Harden has held numerous positions including CEO of the National Association of Conservation Districts, Assistant Secretary for Congressional Relations, Senior VP for the agriculture consulting firm Gordley Associates, professional staff member for the House Agriculture Committee and chief of staff to former Congressman Charles Hatcher (D-GA). During her work with Gordley Associates, representing the American Soybean Association, Harden was instrumental in laying the groundwork for federal biodiesel policies that have been hugely successful in growing a viable biodiesel industry. Harden continues to be a leader on biofuels in Washington due to her passion for the agriculture industry, environmental issues and energy. Also receiving an award today was Glenn Ellis, Hino Trucks (pictured on left). 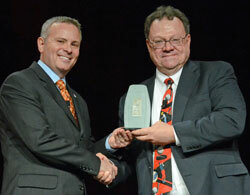 He accepted the National Biodiesel Board’s Eye on Biodiesel Impact Award. Impact: Isuzu Commercial Truck of America, Inc and Hino Trucks. In 2011 two new equipment manufacturers joined the ranks of B20 supporters. Isuzu Commercial Truck of America, Inc., announced that all of its 2011 and forward model year diesel trucks are approved for use with B20.1 Isuzu was a trailblazer as the first Asian manufacturer to approve B20 for U.S. market spec engines. According to Isuzu, the announcement of B20 support was the result of three key factors: growing consumer demand for biodiesel, an extensive internal research project on B20 by Isuzu engineers, and improved biodiesel fuel quality. Hino Trucks, a Toyota Group Company, then multiplied the market impact in July by becoming the first manufacturer to support the use of B20 biodiesel blends in a hybrid-electric truck, as well as in its complete product line of class 4 and 5 cab over, and class 6 and 7 conventional trucks. Hino Trucks is the world’s third largest manufacturer of light and medium duty trucks, and now the fastest growing truck manufacturer in the U.S. With these two additions, 95 percent of the U.S. medium duty truck market now approves B20.